eBay released the infographic below this morning, as covered by Richard Brewer-Hay on the official eBay Ink blog. Following the acquisition of recommendation engine Hunch for $80m in November of last year, eBay has been working quietly on using the company’s technology to revamp its own e-commerce recommendations. This will in time enable the company to move beyond standard item-to-item recommendations and use a broader variety of members’ online tastes to suggest interesting items to purchase. It’s the first we’ve seen on the integration of eBay and Hunch data, which this time looks at the differences between people who have bought or sold on eBay, and those who haven’t yet. It’s probably heartening to eBay that 66% of Hunch users already have. For now, this is just a fun teaser to show what can be done with the 85m responses to Hunch’s ‘Teach Hunch About You’ questions, but before long we should see some really interesting targeting and personalisation integrated into eBay. We can’t wait. MySpace announced this week that it clocked up 1m new users in January thanks to the launch of a new music player. Traffic is still down 25% from the month of June (when News Corporation sold the once-dominant social network to Justin Timberlake and Specific Media) – but could the latest boost in user numbers herald a new beginning for MySpace? XYDO launched its new curated content email platform this week after testing its service on a range of companies from professional basketball teams to FX brokers. Last month, it sent out over 12 million emails tailored from a pool of content based on what three million people have been sharing on social networks that day. Marketers continue to discuss how to keep a personal touch in marketing automation. Though XYDO send out automated emails, they have seen a five percent increase in open rates across the board. We spoke to Eric Roach, CEO and co-founder XYDO, to find out more about their approach and success so far. Should digital marketers be generalists or specialists? 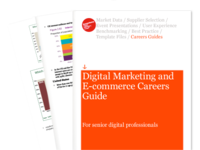 In our recently published Digital Marketing and E-Commerce Careers Guide, we have put together some of the industry’s best advice on how senior digital professionals can improve their career. The advice we received from our contributors was excellent, and in many cases there was a broad spectrum of opinion regarding how best to accelerate one’s career.